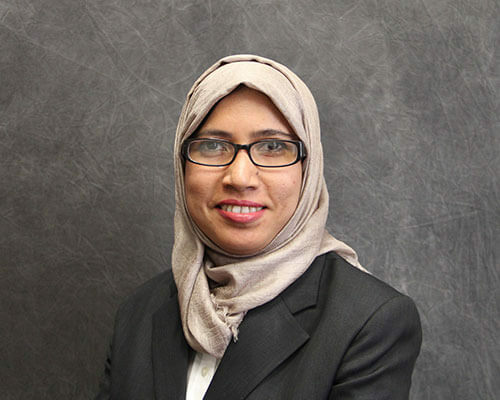 Home » Academics » Schools » School of Science, Engineering and Technology » Faculty » Nazia Afrin, Ph.D.
Nazia Afrin, Ph.D., is an Assistant Professor of Mechanical Engineering at St. Mary’s University. She received her B.Sc. in Mechanical Engineering from the Bangladesh University of Engineering and Technology in 2008. She obtained her M.S. and Ph.D. degrees in Mechanical and Aerospace Engineering from the University of Missouri-Columbia in 2011 and 2015, respectively. Prior to joining St. Mary’s in August 2018, Afrin was a research specialist at the University of Missouri-Columbia where she analyzed computational optimization in multiphase systems and performed uncertainty quantification in thermo fluid science. She was research assistant at a multiscale thermal transport laboratory from 2009 to 2015. Her research led to eight journal papers and three conference papers. She was teaching assistant for thermodynamics and engineering graphics design at University of Missouri- Columbia. Afrin, N., Zhou, J., Zhang, Y., Tzou,D. Y., and J., Chen, J.K., 2012, “Numerical simulation of thermal damage to living biological tissues induced by laser irradiation based on a generalized Dual Phase Lag model,” Numerical heat Transfer, Part A: Applications, 61(7), 483-501. Afrin, N., Feng, Z.C., Zhang, Y., and Chen, J.K., 2013, “Inverse Estimation of Front Surface Temperature of a Locally Heated Plate with Temperature-Dependent Conductivity via Kirchhoff Transformation,” International Journal Thermal Sciences, 69, 53-60. Afrin, N., Zhang, Y., and Chen, J.K., 2014, “Dual-Phase Lag Behavior of Gas-Saturated Porous Medium Heated by a Short-Pulsed Laser,” International Journal of Thermal Sciences, International Journal of Thermal Science, 75, pp 21-27. Afrin, N., Zhang, Y., and Chen, J.K., 2016, “Uncertainty Analysis of Melting and Resolidification of Gold Film Irradiated by Nano- to Femtosecond Lasers Using Stochastic Method,” J. Heat Transfer, 138(6), p. 062301. Afrin, N., Mao, Y., Zhang, Y., Chen, J.K., Ritter R., Lampson, A., Stohs, J., 2016, “Multicomponent Gas-Particle Flow and Heat/Mass Transfer Induced by a Localized Laser Irradiation on a Urethane-Coated Stainless Steel Substrate,” Frontiers in Heat and Mass Transfer, 7, p. 7. Afrin, N., and Zhang, Y., “Uncertainty analysis of thermal damage to living biological tissues by laser irradiation based on a generalized duel-phase lag model,” Numerical Heat Transfer, Part A 71(7), pp. 693-706. Afrin, N., Ji, P., Zhang, Y., and Chen, J.K., “Effects of beam size and pulse duration on the Laser Drilling Process,” ASME 2016 Summer Heat Transfer Conference, Washington, DC, July 10-14, 2016. Afrin, N., Zhang, Y., and Chen, J.K., “Uncertainty analysis of melting and resolidification of film irradiated by nano-to femtosecond lasers using Stochastic method,” ASME 2016 5th Micro/Nanoscale Heat & Mass Transfer International Conference, Biopolis, Singapore, January 4-6, 2016.